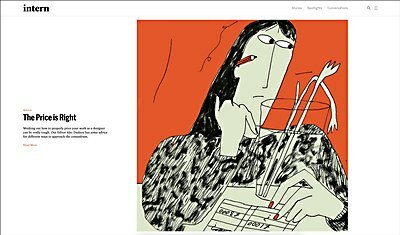 Fashion-forward vitality fuses with kaleidoscopic imagery in this Parisian fashion school’s new site. 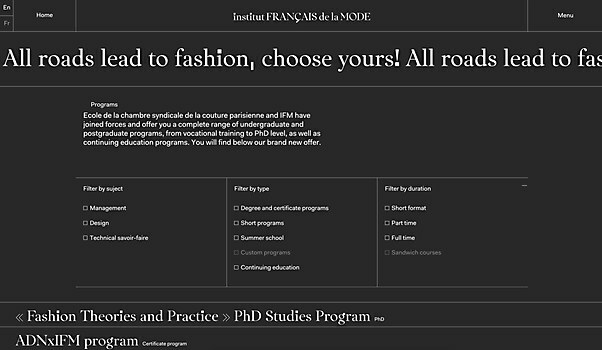 Background: The site for the Institut Français de la Mode announces a new fashion school, the happy marriage between two renowned existing Parisian fashion schools: the École de la Chambre Syndicale de la Couture Parisienne, an institution training the best craftsmen and women of fashion, like Yves Saint Laurent, Karl Lagerfeld and Issey Miyake, and the IFM, the most prestigious school of fashion and luxury management. In addition to this union, the school is creating a new fashion design program focused on creativity. 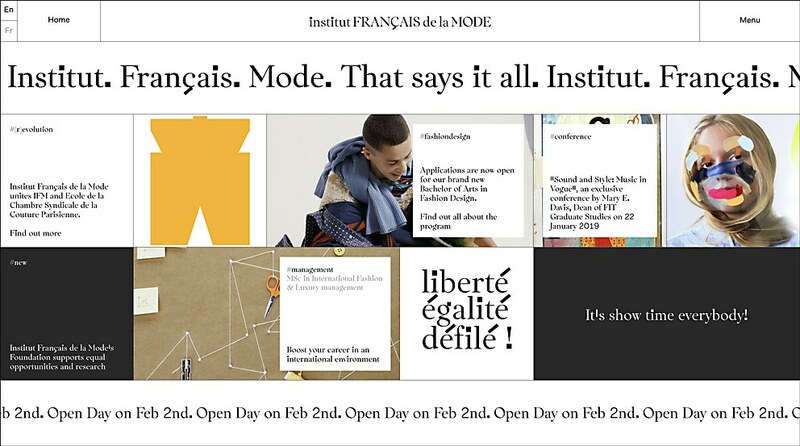 The site combines the institutional side with a younger contemporary side to talk directly to fashion students who are interested in attending the school, showcasing the fashion heritage with the creative programs. Highlights: The new identity. 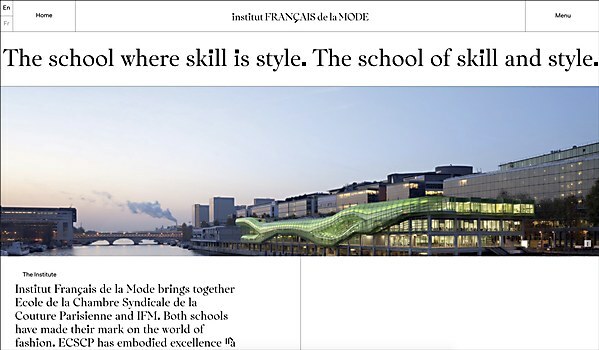 It’s a fashion school in Paris. It had to feel French. 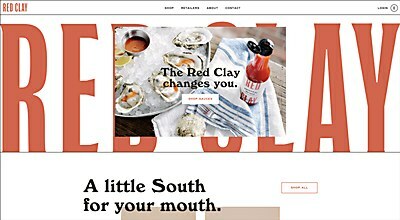 Therefore, we took a classically French typeface and added these big accents. The identity balances the institutional with a young contemporary attitude that would directly talk to potential students. We created the homepage as a kaleidoscope of activities reflecting the energy and fashion forward vitality of the new school. 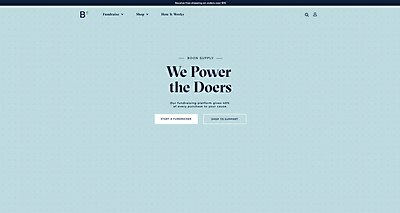 Yet, a simple menu can immediately lead users to specific sections or programs in two clicks. There is both energy and efficiency. Challenges: The two schools becoming one. We had to put those people together. The success of this new identity came from us going in immediately and working together with them to find consensus. Favorite details: I love that we found a new way to talk to students. We mixed French and English in order to do this. It enabled us to make fun of the French seriousness around fashion, but also show that the school is a very serious entity that thoughtfully covers the scope of where fashion and fashion education is going in the future. Also, the art direction of the images. You cannot create a fashion school without great art direction. We worked closely with the professors of the creation department who did a wonderful job art directing the shoots with a pool of photographers and creatives we selected together. Anything new: Bringing together the teachers from the two merging fashion schools in dynamic workshops to help them define their shared future was essential. It was our main objective in the strategy phase. All the preparation work together enabled us to do this faster.